In a fit of legislative insanity, the massive health care bill that no one read included provisions for businesses to issue 1099s to other businesses whenever more than $600 in purchases is made in a calendar year. Wait. You gotta be kidding me, right? The CNN article quoted Tom Henschke, president of SMC Business Councils, who said, "Just with business travel it would include hotels, rental cars. Phone service: 1099. Computer service: 1099. Whoever does your postage meter: 1099. You do a little advertising, Yellow Pages: 1099. Your landlord: 1099. You might as well just keep them in your pocket and hand them out as you go around every day." It takes an average of 30 minutes to prepare a 1099. Small businesses file around 10 a year. Henschke’s group estimated the number of 1099s for the typical small business would jump to 200 for services purchased from corporations. The idiotic provision in the health care bill calls for the issuance of 1099s for the purchase of goods and services. How many 1099s is that? Will it double the number? Triple it? Think about it. Buy a truck. Issue a 1099. Buy tools. Issue a 1099. 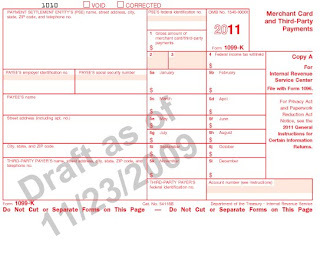 Buy almost anything for business and issue a 1099. So each 1099 costs the company $37. Issuing ten 1099s per year costs $370. Let’s say the required number of 1099s creeps up to 500 when one is sent to every company a small business spends $600 with. At $37 each, this will cost the typical small business $18,500. According to the Census, there were 27 million small businesses in 2004. At $18,500 per company, the cost of the 1099 paperwork to small business will be $500 billion. And this doesn’t include the need to track down the Federal Tax ID for every company receiving a 1099, correcting mistakes, etc. This explains why it was stuffed into the health care legislation. It’s one of the accounting tricks the politicians used to offset the costs of the bill. Let's be honest. 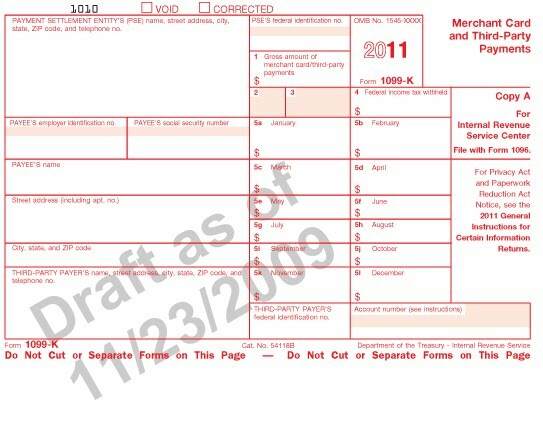 It’s a fantasy that the IRS is going to find $345 billion from requiring every small business to issue a 1099 to Best Buy for purchasing a budget laptop computer and basic software. In fact, I bet the processing expenses alone will cost more feds more than the marginal revenue generated from the provision's enactment. Even if the fantasy $345 billion is realized, it comes with over $500 billion of costs imposed on small business. In truth, it's even worse for small business. To reduce the paperwork and tracking costs, expect companies to try and consolidate purchases, reducing the number of suppliers. Good news for big box stores. Bad news for small retailers. This is no way to run a railroad or a country. Having once been a consultant to the government’s railroad, I observed firsthand how poorly the Feds performed the former. It looks like they’re trying to flub up the latter too. Ask most people what comes to mind when they think of DHL and the most common response is "big yellow trucks." Thus, it shouldn't be surprising to learn that those big yellow trucks helped give DHL a brand awareness of 60%, according to BtoBOnline.com, the web-based magazine for marketing strategists. Of course, it wasn't just the trucks. After 20 years without any advertising, DHL launched a $60 million advertising campaign. The combination of the ads and the trucks vaulted brand awareness from 11% to 60% in two years. Since then, the company's scaled back on traditional advertising, but nevertheless has managed to maintain high levels of awareness. To put things in perspective, DHL's brand awareness is double the brand awareness of the best known air conditioning manufacturer and four times the awareness levels of the second best known brand. While $60 million may seem like a lot of money, it's a drop in the bucket of the $108 billion radio and television advertising market. It's not enough to move the brand awareness needle that far, that fast. So how did they do it? Go back to the trucks. As we do every quarter, we've created a consumer newsletter for our Service Roundtable members. There's a separate version for plumbing, HVAC and electrical, and each one is designed to be very easy to customize and modify. It's free for all members, just like all our weekly content. Over the weekend, I stopped by a pet store to pick up some dog food. Outside the pet store, one of the Animal Rescue Societies had set up, and was giving away dogs. I noticed a small dog, with long floppy ears. This was the goofy, lovable dog that seemed to have the traits of a half dozen breeds. “Ah, the classic American mutt,” I said, reaching down to pet the dog. “So he was a customer dog, but is now a prospect dog and wants to become a customer dog again. I see,” I said, though I didn’t know what the guy was talking about. A Knoxville, Tennessee newspaper reported that a plumber was arrested and charged with photographing without consent. Apparently the plumber was called for a leaking shower. He told the customer she needed to take a shower so he could track down the leak. She feel for it. Presumably, he left the room while she proceeded to shower. After she finished the shower, the woman noticed a lens in the plumber's tool kit. It was a camera (presumably an operating video camera or there wouldn't be the need for the arrest). Clearly the customer's a low watt bulb, but that doesn't excuse the plumber's actions. The story doesn't report the company name so there's no indication whether the plumber was the Principal or an employee. However, more information is promised to be forthcoming, which could include the company name. What if the creepy plumber was your employee? Yikes! How do you protect your company from creepy employees? How do you respond if a creepy employee sabotages your company? Think through your response in advance. While you want to avoid hiring creepy employees in the first place, you want to think through how you would respond with calm and without pressure. During the pressure of the moment, you might not select the best course of action. Are You Thanking Your Customers for Choosing Your Company? There are a number of ways you can say thank you to your new customers - some contractors like using a simple hand-written card, some send a box of cookies or chocolates. This letter does a little more. We (the Service Roundtable) created this welcome letter that gives you a chance to thank new customers for their business, tell them a little more about your company, and provide them with a gift certificate for future service. It's an inexpensive way to cement the new relationship and market your other services at the same time. And the gift certificate is just another way to ensure they call you the next time they need service.